The poll is closed and the techies have spoken. 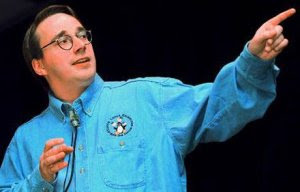 Linus Torvalds has won by majority votes, beating Steve Jobs and Bill Gates for the "what-if" presidency of the United States of America. Thank you for those who took their time to vote for this silly survey. I really appreciate it. I know that Linus is not qualified to run for US President because I think his nationality is still Finnish even though he is now living in the States. Anyway, it is interesting to know that many still voted for him despite this fact. We have a new survey question right now. I want to know what web browser are you using aside from Firefox. Me? I use Kazehakase and Flock as alternate browsers. --Kazehakase for its speed and Flock for its cool features. Epiphany, because one one website Firefox decided to start crashing for no reason. And it always crashes. So I use epiphany or Liferea to view it. Konqueror, and it really rocks! And inn rare cases Opera too.